They say one man’s trash is another man’s treasure. We couldn’t agree more! In fact, that’s one of the things we do best here at Agricola Redesign! Taking existing pieces from your home, or sourcing them from places like the Salvation Army’s Thrift Store, Goodwill or even the ReStore that benefits Habitat for Humanity, you can often find an old dresser, mirror, chest, or other furniture pieces that just need a little love to transform it into a piece YOU’LL love! Whether it’s installing barn doors on a pulley system in your living room or using an old dresser as a television stand, repurposing rather than discarding is the new trend and we have to say, we love it. They often say that necessity is the beginning of creativity. When you absolutely need something (like more storage, for example), you’re going to get creative and “create” whatever it is that you need. What do you need in your home? Is it storage? Have you considered staging old suitcases to create a unique end table that can also store what you need? 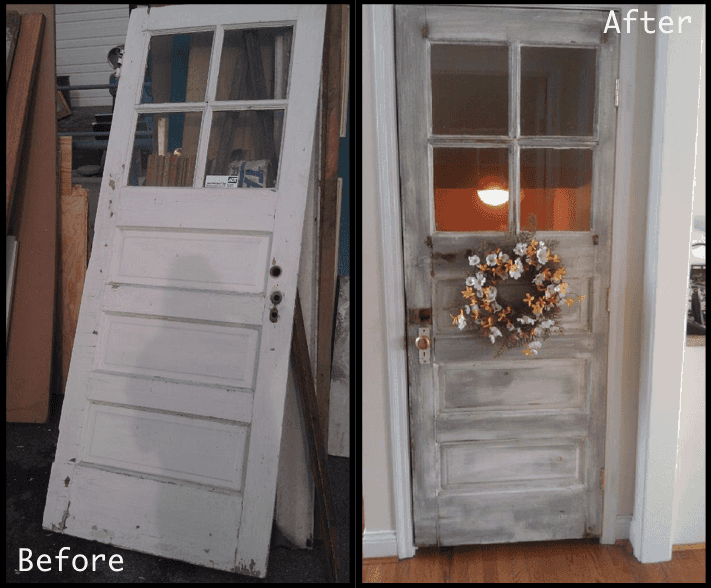 To give you an even better idea of turning trash into treasure, check out this old salvaged door we purchased and painted to use as the entry to our clients’ lower level. It’s a fun AND shabby chic trash to treasure adventure! We were able to give it a washed out look with some paint and sanding, and some new hardware helped us achieve the shabby chic look we were going for. And the wreath is just an added bonus that helps add a little color to the neutral door!